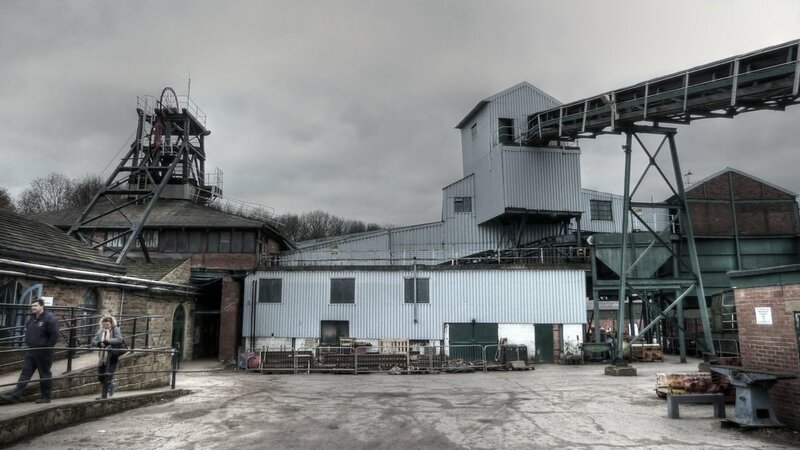 This is a project to create a memorial garden linked to the National Coal Mining Museum for England. 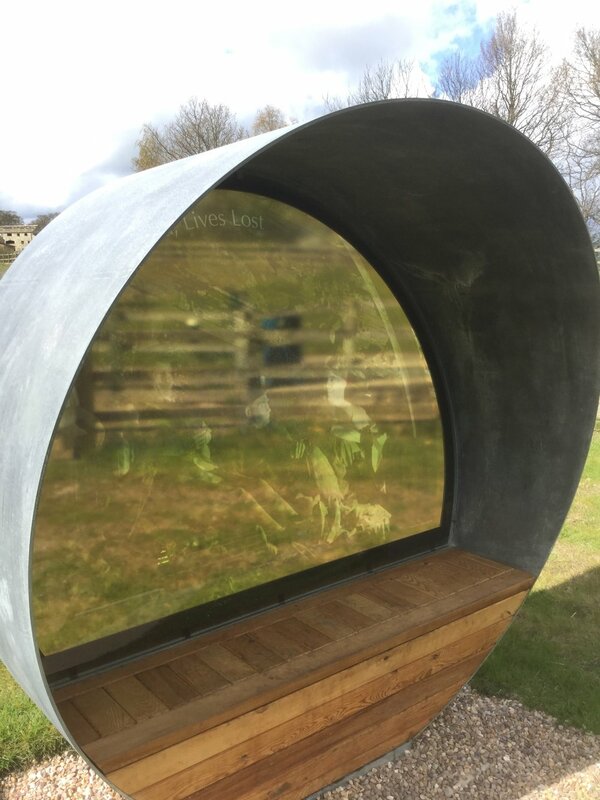 Our task was to produce an artwork that forms an integral part of the garden, involving in the first instance a series of screens to commemorate miners and their families. The garden is a national memorial and, as the project’s title suggests, acknowledges all who lived their lives in mining communities, as well as those who lost their lives in the pits. 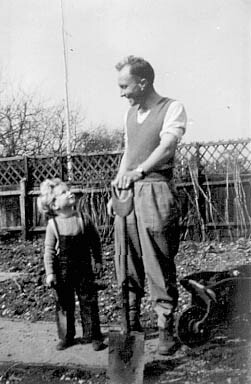 Our approach began with asking how the garden is to be used. The fact the site is set apart from the museum and car park is significant. People will most likely tour the museum first, then make their way over to the garden. They will enter the garden after the intense experience of having been underground. This should bring with it a sense of relief, echoing the relief miners felt on coming above ground at the end of a shift, a feeling of having found sanctuary. Sitting in the right surroundings, allows people to reflect on where they have just been, and on the lives of those who worked underground. Visitors with a family connection to mining, have the opportunity to take part in a meaningful response, along with their reflections - an act of commemoration. The memorial aspect of the garden is something visitors themselves build and contribute to. Acts of commemoration performed by visitors from all over the country, leave permanent marks, so that the garden itself, is seen to be a place that brings people together from many and varied places, within the mining community. The garden can also be seen in terms of a chain of functions, each link leading to the next. It is a place in which to seek relief, to sit, to think, to be, to take part, to gather together. 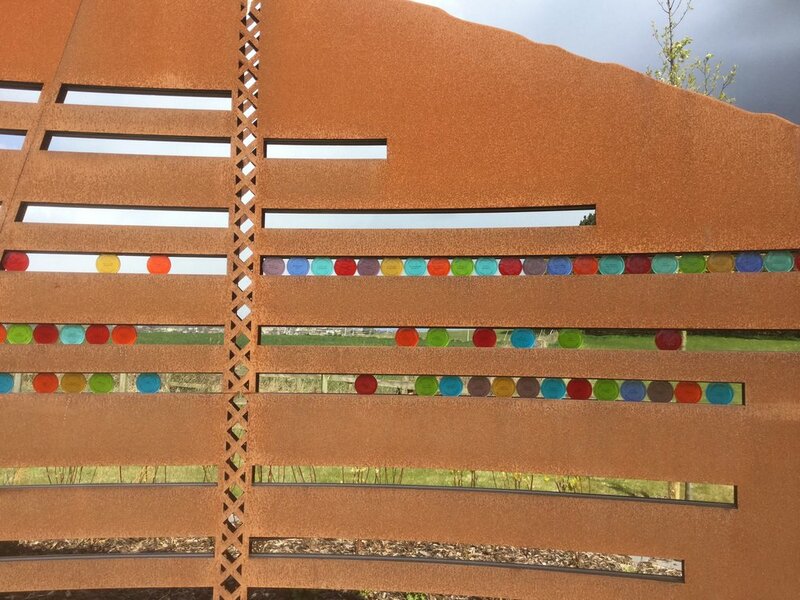 Our concept for the garden centred on a series of weathered steel screens, that become an artwork-memorial, filling with colour and growing as visitors place tokens within, to honour relatives who worked in the mines. Each screen is designed to suggest a seam of coal, pierced by the workings of a mine. Channels cut to represent the shafts and levels, plus the undulating shape of the screen itself, serves to lighten the overall impression and let wind pass through the structure. Each channel takes the form of a groove sitting between two sheets of steel into which a coloured glass disc is inserted. A spring-hinge at the beginning of the channel prevents a disc from being removed again. Each disc contains the name of a miner, his colliery and relevant dates. The disc has the association to a miner’s tag, with a disc placed into a channel in one of the screens, suggestive of a miner at work. The use of coloured glass reflects the character and life of all those connected with the industry. For visitors connected to mining , this creates a work-in-progress, to which they can contribute. For other visitors, it creates a stimulating artwork and moving memorial to explore. 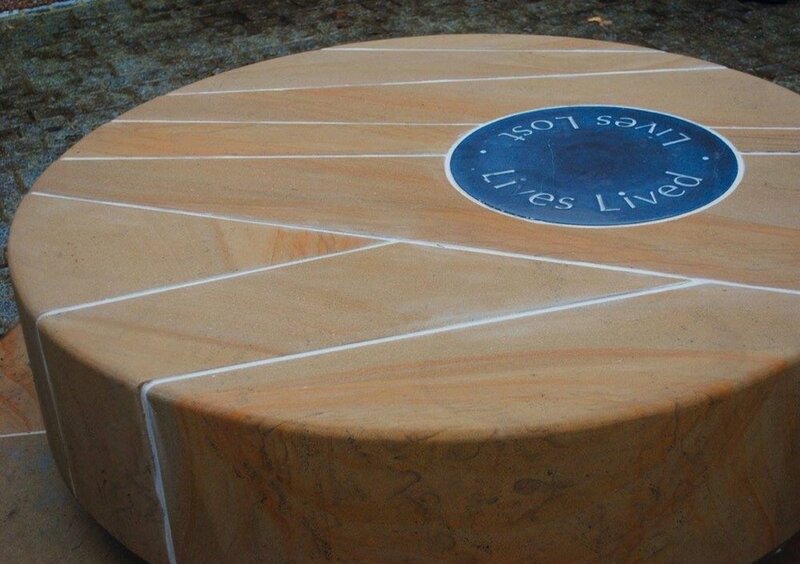 In time, discs bearing the names of miners from collieries all over the country, will come to sit side by side. 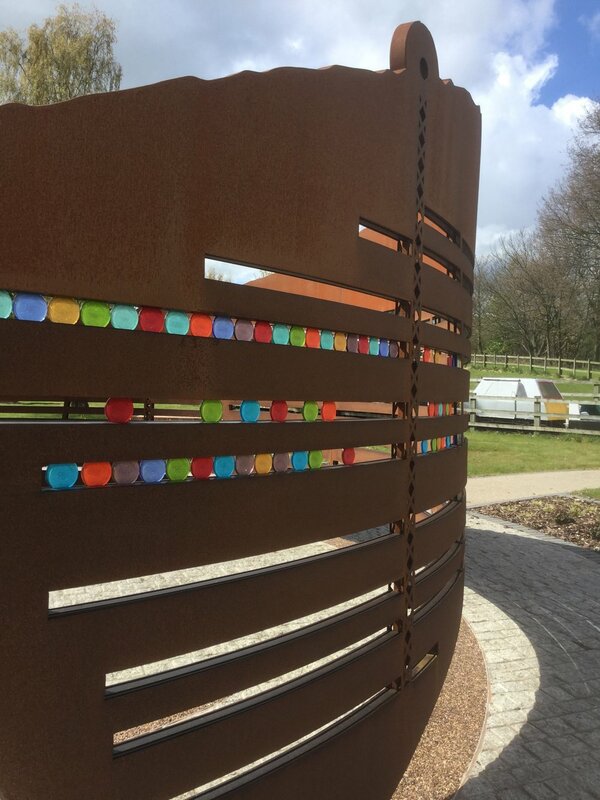 As it grows, the screen will resemble a stained glass window, made by the multitude of different coloured discs, with some coloured discs representing miners who died underground, some reflecting miners working lives and other discs relating to groups and associations, connected with the coal mining industry. 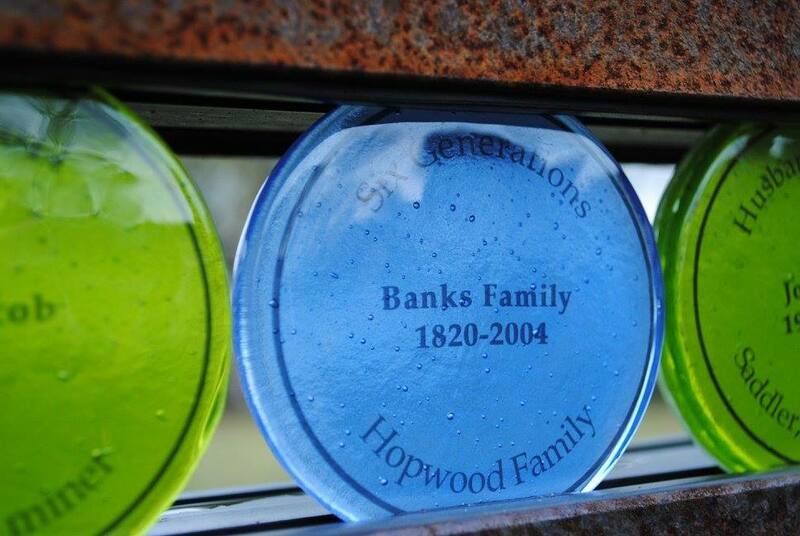 Individuals, families or groups are able to order and purchase a glass disc through the museum website. This will enable people to participate anywhere in the country or across the world. The central, circular seat feature is fashioned from Longridge Sandstone, within which, coal flecks can be seen. It includes a circle of granite with a simple carved epigraph, ‘Lives Lived, Lives Lost’. 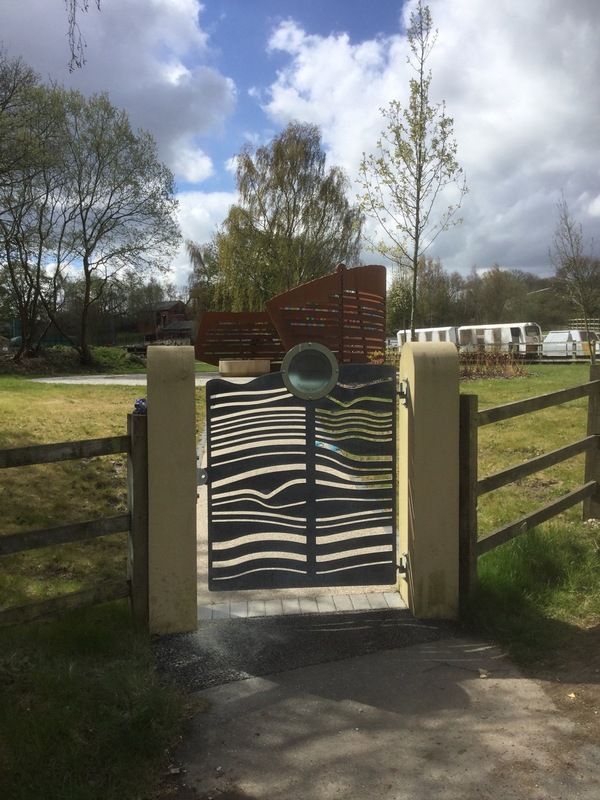 It is proposed that one day, the stone will become a place where visitors can access, through their own digital device, different stories, sounds or songs relating to the mining community. While the artwork-memorial itself addresses the need to bring people together and give them something to do, the specific way it is designed and laid out, has a bearing on the garden as a refuge and contemplative space. 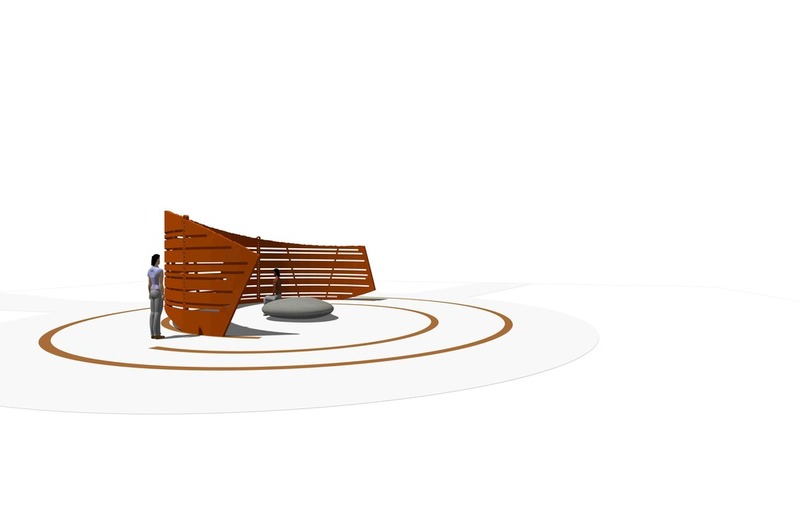 The concept of a 'work-in-progress' memorial, has the idea of development built into it . The work takes shape and grows as visitors contribute to it. There is also the potential for even further development. It is possible that the day may come, when there are no more slots available in the screen for further discs. If this point is reached, it will create the need for a further screen. This has already be considered and provision made within the foundations.